OPINION: As shipping increases in a melting Arctic, U.S. national security concerns justify spending in infrastructure upgrades to make Nome a true deepwater port. While cooperation has been a hallmark of Arctic relations between the United States and Russia, it is important to consider national security due to increased competition between the two nations. The opening up of navigable Arctic shipping routes puts the U.S. at a severe disadvantage, suggesting the need for the U.S. government to consider using federal funds to establish an Arctic deepwater port in Alaska. Currently the U.S. and Russia are productively working together. From the Aleutian Islands up through the Bering, Chukchi, and Beaufort Seas, the two countries’ coast guards share infrastructure and collaborate on economic, environmental, and safety-related ambitions. Even in the face of stringent international sanctions, Russia stresses its commitment to international agendas related to the Arctic, where Russian lands comprise almost half of the territorial borders there. What’s so unique about the Arctic to Russia? In short, its rapid melting and the resulting unlocking of a fourth ocean provide the potential for massive economic and geopolitical gains for those well-prepared to capitalize. And while Russia’s Arctic infrastructure — from ports to icebreakers to technology — is the world’s best, U.S. Arctic infrastructure is rickety and sparse where it even exists at all. Russia boasts a fleet of around 40 icebreakers. The U.S. owns three polar-capable icebreakers, two of which are functional. Ports line Russia’s Arctic coast, and deep water ports in Murmansk and Provideniya that are essential for housing icebreakers bookend the Northern Sea Route, Russia’s primary Arctic sea highway. Meanwhile, the U.S. has not even started building a single deepwater port in the Arctic. In January 2015, the Army Corps of Engineers recommended an expansion and dredging of the port of Nome as the top candidate among a host of viable locations for America’s first deepwater Arctic Port. The Corps’ report highlighted Nome for its minimal environmental impact and proximity to the Bering Strait and Chukchi Sea, among other features. Yet, the Army Corps’ economic forecasts were shaky. The net lifecycle benefit-cost ratio was only 0.13 (or $0.13 returned for every $1 invested) in the base scenario and 1.26 in the most optimistic scenario, which entailed vibrant growth of oil and gas in the Chukchi Sea. As the Army Corps’ mandate was to assess this port’s economic viability, they understandably paused efforts on Nome’s deepwater port expansion in October 2015 after Shell terminated oil exploration in the Chukchi Sea following a “disappointing” search process. And last month, the Corps of Engineers announced they would undertake a new feasibility study. 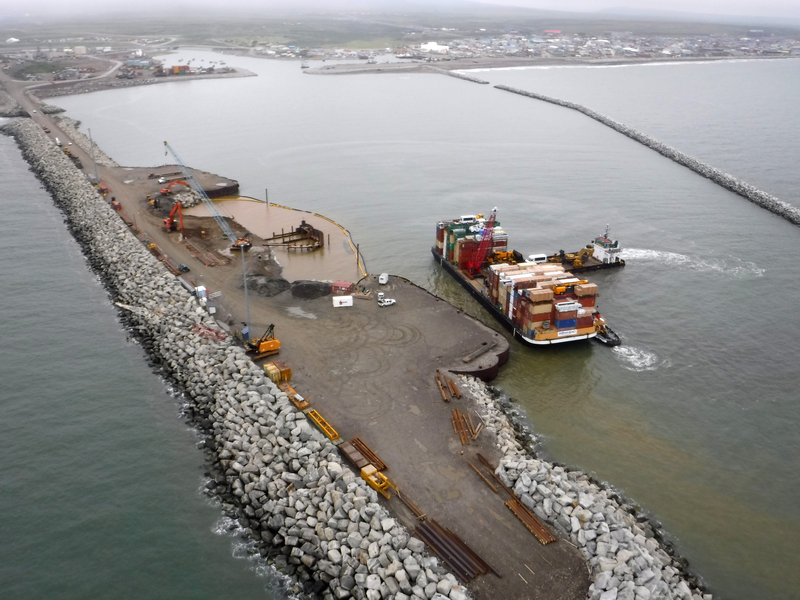 National security considerations associated with budding Arctic shipping channels justify a $200 million-plus federally funded expansion of the port of Nome. Near the Bering Strait, Nome sits at the mouth of three of the four most prominent Arctic shipping routes: The Northern Sea Route, the Northwest Passage, and the Transpolar Sea Route. While Arctic shipping’s economic potential is far from certain, its enormous upside has inspired Lloyds and Chatham House to forecast over $100 billion in Arctic infrastructure investment over the coming decade. And China, the world’s largest exporter, envisions a highly-trafficked Arctic by 2020. Meanwhile, even if the U.S. were to approve port of Nome’s expansion tomorrow, the port’s deepwater portion wouldn’t be available until 2025. The more time it takes the U.S. to build this infrastructure, the more time Russia will have to cement its influence in shipping traffic patterns in the Bering Strait. Such a scenario would result in Russia establishing standards and norms related to business practices in an Arctic frontier whose melting and, thus, unlocking is inevitable. U.S.-Russian relations regarding the Arctic have been exemplary to date, and hopefully they continue this way. However, it is naïve to expect that this cooperation will continue in perpetuity with a mercurial global actor that has repeatedly sought in recent years to destabilize western order. The U.S. needs to prepare for a world in which the Arctic frontier becomes a highly trafficked shipping highway and U.S.-Russian relations in the Arctic resemble relations outside the Arctic. A first step in such preparation is financing a strategic deepwater Arctic port at Nome. Peter Sopher is a concurrent MPA/MBA candidate at the Harvard Kennedy School and Wharton. This past summer he was the inaugural Birol Fellow at International Energy Agency, and prior to graduate school he worked at Environmental Defense Fund as a Clean Energy Analyst and International Climate Fellow.